The designers were a remarkably talented group who worked collaboratively with each other and with the staff. What could easily have turned into a vanity fair became instead an organized and thoughtful process that created a center for horticulture, art, design, and ecology in South Florida. It all started in 1993 with a cadre of people wanting to reclaim the site of an old shopping complex and garbage dump. Philanthropist Harvey Kapnick Jr. purchased the site in 2000, and they were off. Brian Holley, the founding executive director, remembers when he got the call: “He said, ‘I have a hundred and seventy acres of Florida swamp and want to build a botanical garden.’ Probably the wackiest proposition I ever heard. Even crazier, we did build it, and it is beautiful! Just ask the thousands of people who visited last year!” They unpaved the lot and put in a paradise. By 2014, the theme gardens were completed, two lakes were dug, and the excavated soil was used to create elevation. Plantings were in. Now, over a quarter of a million visitors a year come to enjoy the impressive demonstrations of the flora of the tropics. It is a garden based on latitude—26° north and 26° south, to be precise. This includes the tropics and a few degrees of subtropics, to account for Naples itself. Every plant found in this garden lives within that equatorial band in one or another of the world’s many tropical and subtropical ecosystems, and four of the main gardens here—Asian, Brazilian, Caribbean, and Florida—underscore the geography. Creating a series of theme gardens always runs the risk of turning a good idea into a petting zoo for plants, but, in this case, commissioning five garden designers with different styles and personalities proved to be fruitful. The different gardens have distinct personalities, but blend and connect to create a remarkably harmonious whole. Florida is a land defined by water. The Florida Garden captures this in a series of hummocks, a Southern term for naturally occurring elevated mounds, habitat islands rising out of the marsh, that tend to be circular in shape. 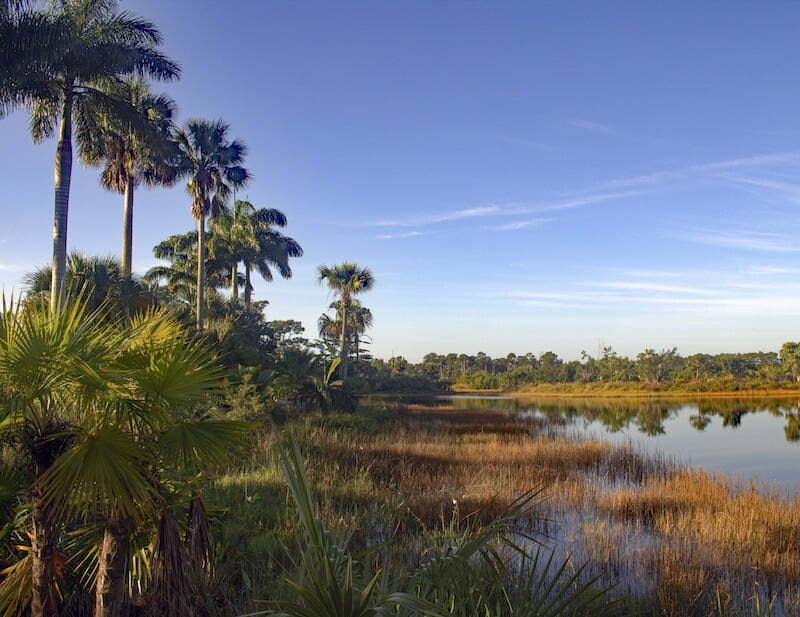 This enclosure is surrounded by the area’s characteristic grasses and representative native palms, such as the sabal palm (Sabal palmetto), the Everglades palm (Acoelorrhaphe wrightii), and the graceful royal palm (Roystonea regia). The enclosure of palms and the slight rise of land directs the eye around and up, up to the sunny sky. A delightfully sinuous river of grasses and sedges, sawgrass (Cladium jamaicense), Gulf Coast spikerush (Eleocharis celluosa), sand cordgrass (Spartina bakeri), and spiky Fakahatchee grass (Tripsacum dactyloides) weaves around and through the circles and down to the water where the duck potato (Sagittaria lancifolia) grows. 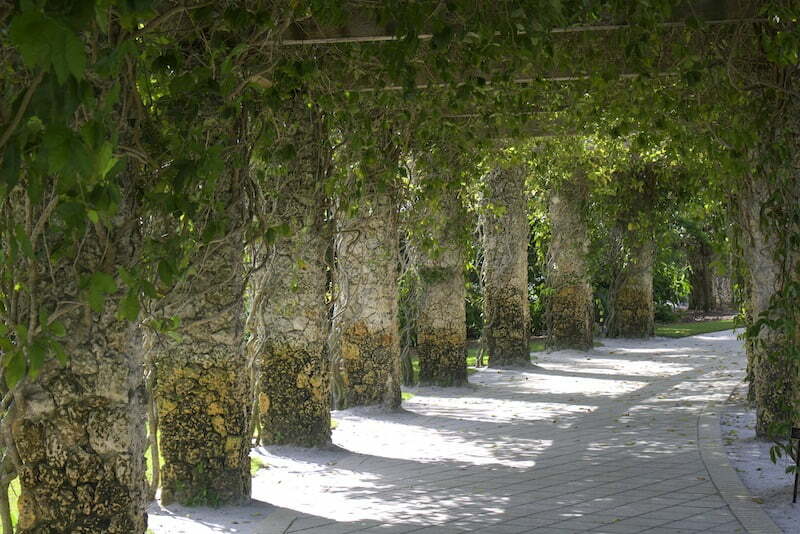 Successful landscape architecture is a bridge between the natural and the man-made. The Florida garden is a success because it translates the native environment for those who do not know it and are unlikely to venture into the wild. It is a civilized approach to what lies beyond: The Preserve is a 90-acre (36-hectare) refuge of the greatest importance in terms of natural habitat, conservation, and ecology. It is home to 300 species of native plants and a rich profusion of wildlife. White pelicans bob on the water, the magnificent frigatebird soars on long wings, and purple gallinules search for frogs in the marshes. There are red mangrove (Rhizophora mangle) swamps, flatwoods of slash pine (Pinus elliottii var. densa) and coastal plain staggerbush (Lyonia fruticosa), and coastal scrub made up of scrub palmetto (Sabal etonia), Florida rosemary (Ceratiola ericoides), and wiregrass (Aristida beyrichiana). Beyond the garden walls, these habitats are threatened by a general disregard for the natural environment, unrelenting greed, and the ever-expanding subdivisions, country clubs, and shopping malls. It is astonishing to think that large areas of the 4,000-square-mile (10,360-square-kilometer) Everglades were drained for agriculture and building development and planted with the thirsty and invasive Australian punk tree (Melaleuca quinquenervia). One of the most important wetlands in the world is now contaminated with fertilizer and receives a third of the amount of water it once did. If the garden did nothing but protect these ninety acres, it would be a place beyond value. 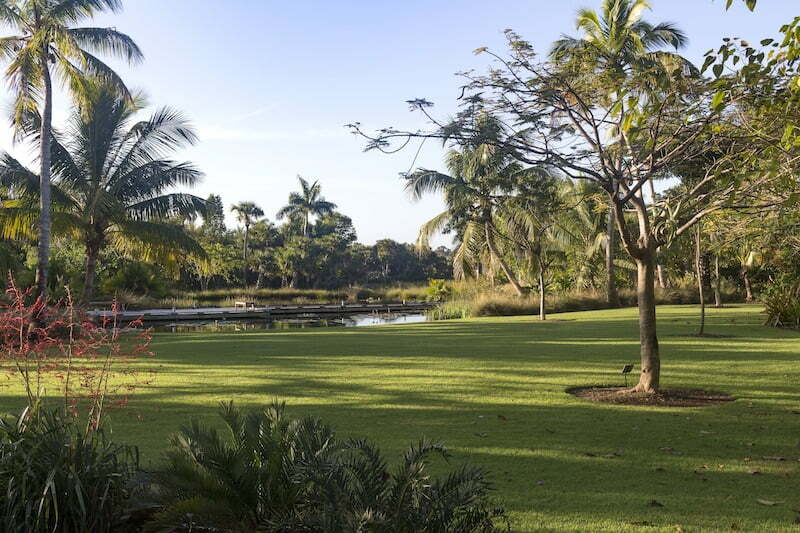 “Naples Botanical Garden sits at the epicenter of a looming conservation crisis. There are over 2.8 million acres (1.1 million hectares) of public lands within a hundred miles of the garden that are threatened by increasing numbers of invasive exotic plants and animals, introduced diseases, climate change, and the ever-growing pressures of urbanization. The garden’s current conservation programs protect several species of native plants that are directly threatened with localized extinction,” explains Chad Washburn, its deputy director. There is more richness. The Caribbean Garden includes many cultivars, varieties, and species of plumeria, also known as frangipani. Tough plants with flowers that have an almost overwhelmingly sweet perfume, the common name is thought to come from a sixteenth-century Italian nobleman, Marquis Frangipani, who scented his gloves. When the flower was discovered by Europeans, its perfume reminded them of the scent, and so the flower was named after him. This may not be entirely true, but it is an agreeable story. The edge of the Preserve, a 90-acre (36-hectare) wildlife sanctuary, wetland, and forest, is a part of the Naples Botanical Garden. Image, Christopher Woods. Robert Truskowski, internationally acclaimed landscape architect, designed the Caribbean Garden with ethnobotany—the study of how people use indigenous plants—in mind. There is a human scale to this area, in that it appears to be less of a display garden and more of a space that interconnects the fruits, flowers, and trees of the Caribbean with its peoples: calabash trees (Crescentia cujete), the national tree of St. Lucia; the so-called wild poinsettia of Trinidad and Tobago (Warszewiczia coccinea); and the Pride of Barbados (Caesalpinia pulcherrima) with ever-blooming, fiery red flowers. A Caribbean garden would be incomplete without coconuts, and Cocos nucifera ‘Maypan’, a cultivar bred in Jamaica for its resistance to lethal yellowing disease, grows tall in the heat and sun of Florida. The garden is as relaxed as the region it represents. The Brazilian Garden is a living tribute to one of the greatest nature artists of the twentieth century, Roberto Burle Marx. Called by the American Institute of Architects “the real creator of the modern garden,” it’s difficult to overstate his influence. 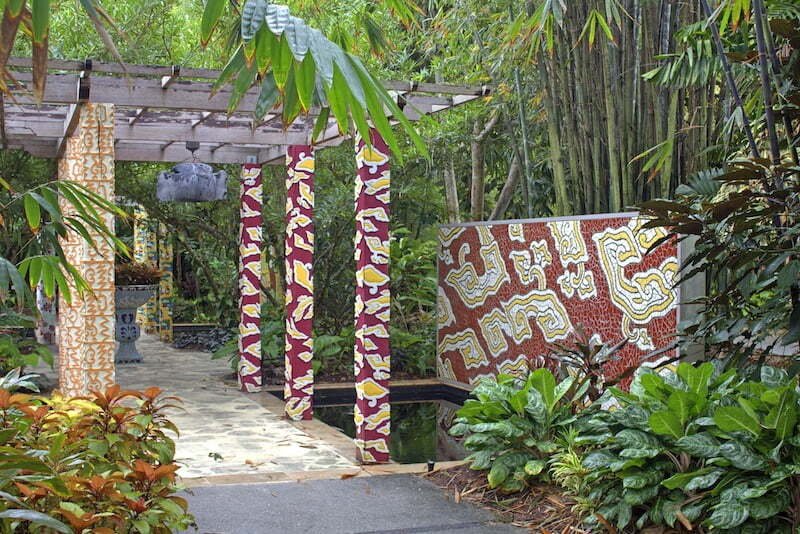 His friend and protégé Raymond Jungles designed the garden with a tropical vibrancy and artful passion, and included a colorful ceramic mural by the master himself. The piece presides over all on a platform high above a two-tiered waterfall that pours into a large, black-bottomed pool where enormous pads of the Amazon water lily (Victoria ‘Longwood Hybrid’) grow up to 5 feet (1.5 meters) across. It is also framed by kapok trees, árvore sumaúma (Ceiba pentandra), South American palms, cattleya orchids, and mass plantings of bromeliads. Alcantarea imperialis, a Brazilian giant, lives up to its royal name with a mass of foliage that can grow to 4 feet (1.2 meters) high and red flowers reaching up to 6 feet (1.8 meters). It is planted in large groups with colorful varieties of Neoregelia and Aechmea, and the aptly named, red-stalked, lavender and green flowers of Portea ‘Jungles’ imported from Burle Marx’s own garden. The garden feels effectively like a contained wildness with a just a trace of jungle fever. The Asian Garden, designed by Made Wijaya, an Australian who lived in Bali from 1974 up to his death in 2016, bursts with a complex encapsulation of Southeast Asian plants and culture. It is sometimes frenzied, fantastic, and flamboyant. Much like the man himself. A Thai Pavilion surrounded by water marks the garden’s center. The red flowers of ‘Holy Fire’ and the pale gold of ‘Soaring Golden Phoenix’ lotus (Nelumbo nucifera) rise up out of the still water. The pale blue stems of tropical blue bamboo (Bambusa chungii) arch overhead. The black-tinged green leaves and black stems of a banana, Musa ‘Thai Black’, add darkness to the lush green of this mass of tropical foliage. A stepping-stone path leads to a Balinese shrine, the shrine of Dewi Sri, the goddess of rice and fertility. Snake fruit (Salacca zalacca), a small palm that gives clusters of red-skinned fruit, encloses the area, while a path leads to a walled area of abstract mosaics featuring stylized Asian motifs. A Javanese ruined temple and limestone plaza is complete with statues made by Balinese craftsmen. 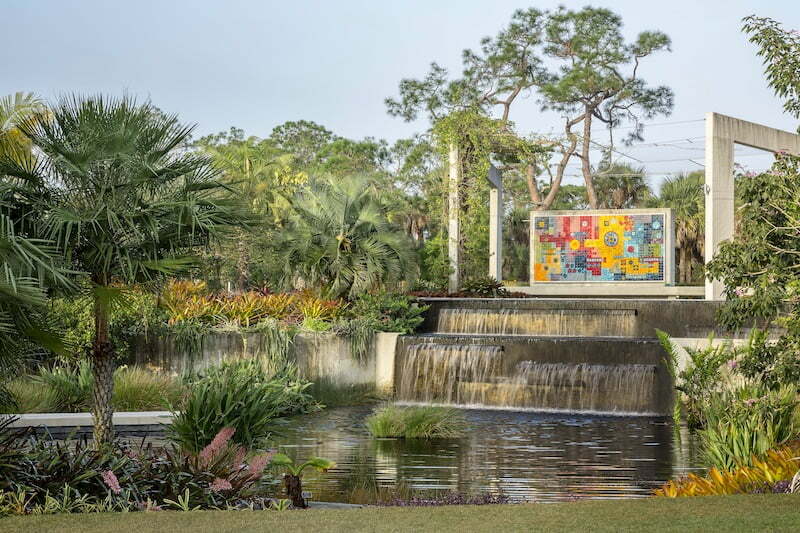 Naples Botanical also features other gardens, including an orchid garden, a garden of the most “charismatic” or bizarre plants from the region, a garden meant to evoke the paintings of Henri Rousseau, and a Children’s Garden designed by Herb Schaal. The remarkable thing about the Naples Botanical Garden is that it looks and feels as if it has been in existence for decades rather than just a few years. It is this way because of the lusty nature of tropical plants, the skill of the staff, and the landscape architects’ intelligent designs. This is an excerpt from Gardenlust Christopher Woods latest book, available from all good book shops.